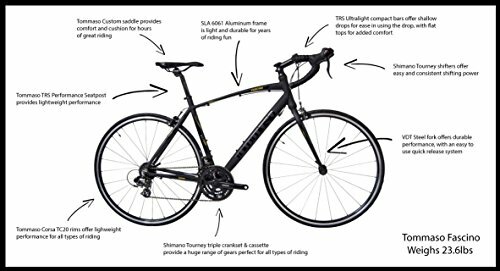 YOU DON'T NEED TO SPEND MORE THAN $500 - Because Tommaso is a direct to the consumer brand you can now get a bike with 100% Shimano gears, super lightweight aluminum frame, and lightweight wheels for under $500. Tommaso gives you value like no other brand. We provide a lifetime frame warranty and great service through our U.S. based customer service team. 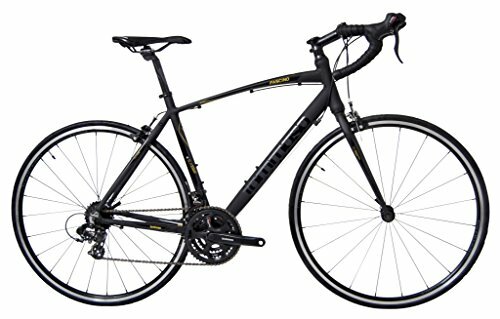 THIS IS NOT A BEGINNER BIKE - If you are new to cycling, this is the bike for you. New cyclists don't need "beginner bikes" they will outgrow in a year, they deserve affordable performance. The Fascino embodies the idea of affordable performance with a high quality mix of components seen on bikes that cost $100's more. READY TO TAKE YOUR RIDING TO THE NEXT LEVEL? 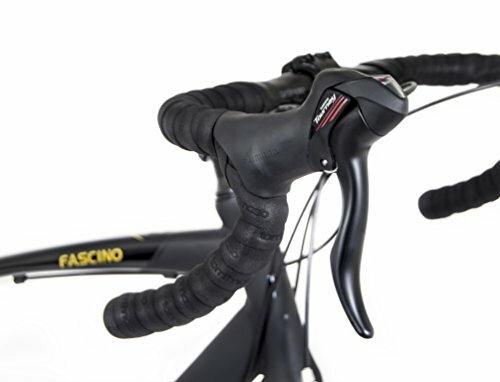 - The Fascino will give you all the power, performance, and speed you need to tackle your first century or an extended hilly ride. Using a 3x7 Shimano drivetrain and a huge gearing range will allow you to climb any hill with ease while still having the speed you need for the flats. NEVER MISS A SHIFT - Shimano Tourney shifters provide reliable shifting in all riding conditions. 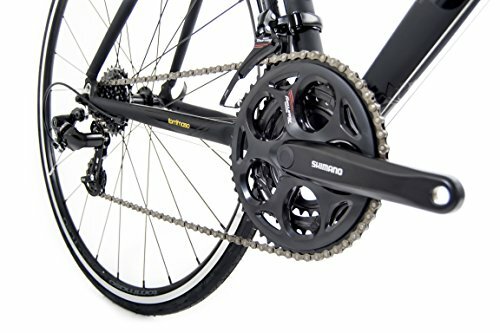 While competitors use off-brand parts to save money and cut corners, we use a 100% Shimano drivetrain. Why? Because Shimano makes the best gears on earth, and they work at the peak performance when used as a complete set. YOU DESERVE A COMFORTABLE RIDE - Our compact frame geometry, premium compact handlebars, and anatomically designed seat offer increased comfort in a sleek package. Every part of the Fascino is designed for maximum comfort and efficiency, so you are getting the most out of every ride, whether it is 10 miles or 100 miles.